Dr. Levi Spear Parmly, a New Orleans dentist, invented floss in 1815. Flossing has been touted by dentists since as being the most effective way of preventing cavities and gum disease. Is it true? Flossing is something most people think they need to do. After all, every dentist and hygienist I’ve ever met thinks flossing is imperative for good oral health. Yet, according to statistics, only 12% of Americans floss daily and 49% don’t floss at all. 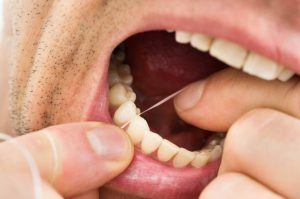 The controversy about flossing was fueled by a NY Times article several years ago that discussed the matter and the fact that the US Department of Agriculture and the Department of Health and Human Services dropped the mention of flossing as part of their hygiene recommendations due to lack of “evidence based” studies. So what’s the scoop? Should YOU floss or not? YES, you should, but it’s not always so simple. Unfortunately, as in most healthcare matters, there’s no simple answer as to whether flossing is righ t or wrong, effective or not? It’s complex and based on your personal, unique and individual needs and risks. Every time you visit our hygienists, they evaluate the “effectiveness” of what you’ve been doing vis a vis your oral health. They ask about your medical health and any changes because we know how that can impact your mouth. They look for cavities, gum inflammation, tongue health and even cancer. They scrutinize all aspects of your mouth to make sure all is well. And, if there are areas of concern, they bring it to the attention of your dentist. We want to help your mouth stay healthy because we know it will contribute to your overall health and wellness. So, we might recommend that you change what you’re doing. We might recommend that you floss. We might recommend that you don’t and use some other method to clean between your teeth, like inter-dental brushes or an air flosser. We might also recommend that you take a bacteria profile so we can see what’s happening microscopically. We might recommend that you use a different toothpaste, rinse or even an oral probiotic. We might recommend that you come to see us more frequently. Indeed, in some cases, there are more effective systems than flossing to clean the “between the teeth” areas that can help prevent gum disease and especially, root cavities. Your visits to the hygienists in our practice are often the most important for long term oral health. And for those who have invested a lot of time effort and money into their mouths, these maintenance visits pay off handsomely. They are indeed, the best return on investment you can make. So floss, but we also may recommend adjunct treatments to help you clean between your teeth. So, we’ll see you soon at your visit with one of our fantastic hygienists!